In 1909, following the Turkish massacre of 30,000 Armenians in Adana, Turkey, Armenian writer and activist Zabel Yessayan journeyed to the region to provide relief to survivors. 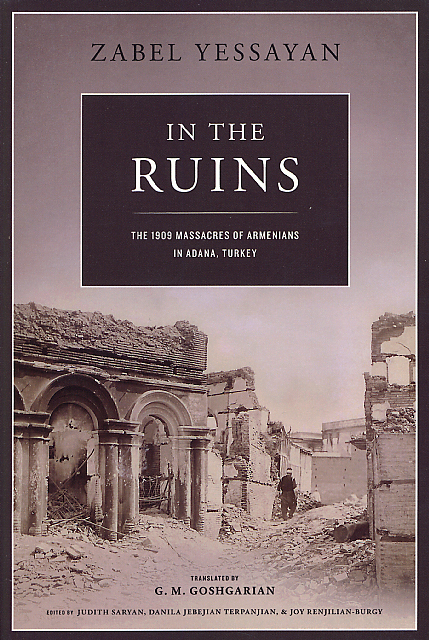 She wrote her monumental account In the Ruins as a powerful testimony of this devastating event, considered a prelude to the 1915 Armenian Genocide. Her compelling images convey the horror and destruction she witnessed. Translated here into English in its entirety for the first time, In the Ruins has been acclaimed as one of Yessayan's most influential works. "On pages that will live forever, our national sensibility is condensed with an intensity, a humanity, and an authenticity that is unrivaled in our ancient or modern literatures," Hagop Oshagan, Panorama of Western Armenian Literature, vol.6.